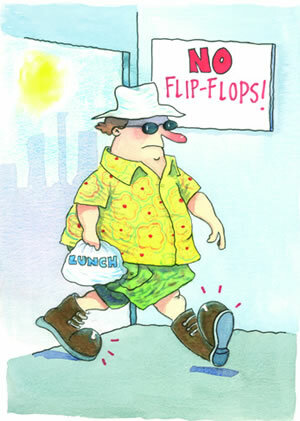 During the summer, many of us think about wearing sandals or flip-flops to work to help us stay cool. Despite recent reports to the contrary, health and safety law doesn't ban them. However, slips, trips and falls do account for about 30% of all workplace accidents, and what you wear on your feet can make a difference. So, if you work somewhere where the floor can't be kept dry or clean then wearing shoes that fit well and have a good grip would be a better choice than flip-flops.